LMS Class 8F 2‑8‑0 No. 48045 awaits its next turn of duty at 8E Northwich – date unknown. Allocated to Northwich for many years up to February 1961, No. 48045 served from a host of depots prior to withdrawal in May 1968, including Toton, Mold Junction, Westhouses and Edge Hill (Liverpool) to mention but a few. Photograph by Anthony Wakefield collection. 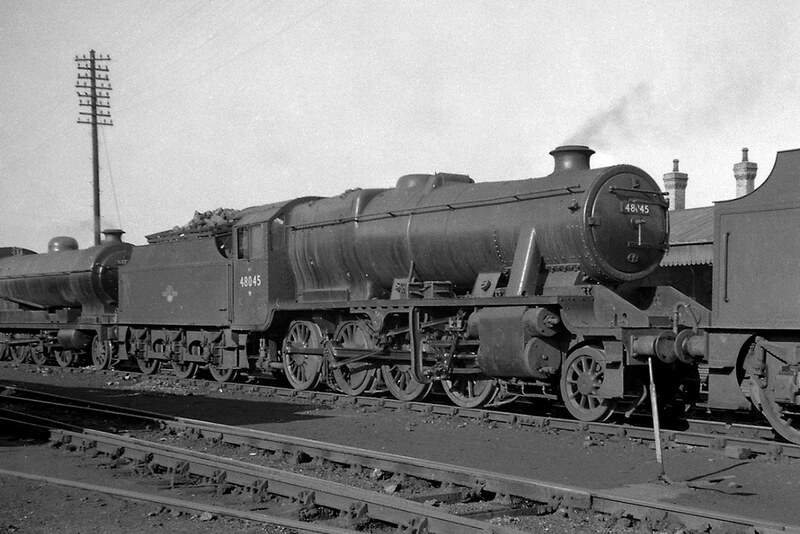 LMS Class 8F 2‑8‑0 No. 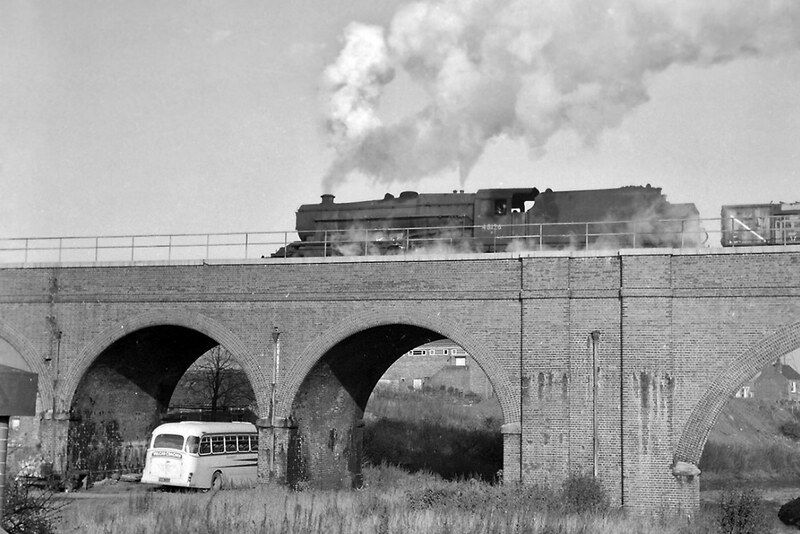 48162, a long‑term resident of 55D Royston, trundles over a viaduct at Catcliffe‑Tinsley with a goods train – circa 1967. Transferred to the North Eastern Region (56F Low Moor) from the London Midland (24H Hellifield) in June 1958, No. 48162 had a brief spell at 55B Stourton (9.58‑2.59) before moving on to 55D Royston being condemned from there in April 1967. LMS Class 8F 2‑8‑0 No. 48281 at rest against a buffer‑stop at 55D Royston on 8th August 1965. To the left of No. 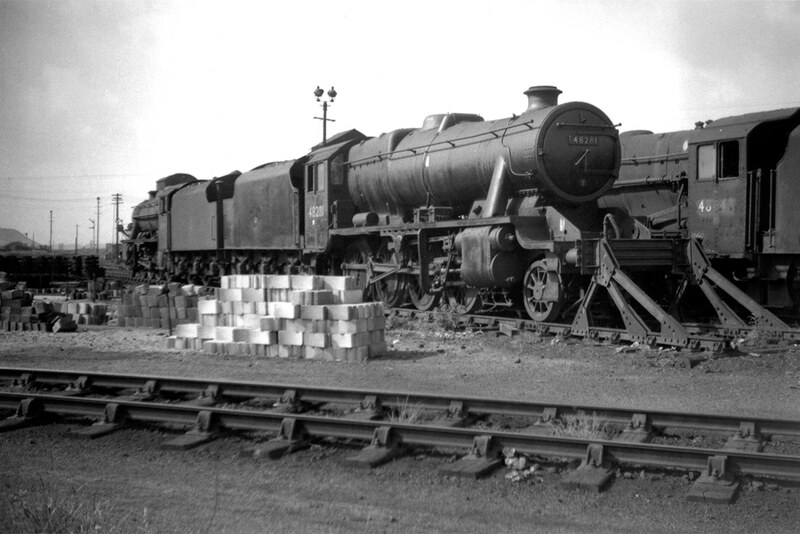 48281 and sporting a ‘not to be moved’ notice is a second LMS Class 8F 2‑8‑0 No. 48710. Completing the trio of 8F’s is No. 48443. All three locomotives were residents of Royston MPD a depot which stayed mainly in the hands of steam until closure on 6th November 1967. 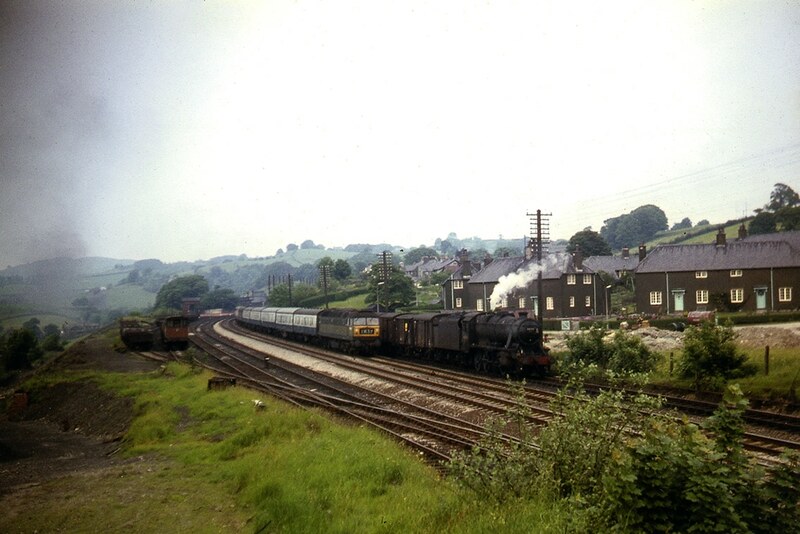 Safety valves gently lift from LMS Class 8F 2‑8‑0 48334, from 8E Northwich, as it waits for a southbound path with an up freight at Oxenholme on 16th July 1967. Speeding past No. 48334 with an up express is Class 47 No. D1621. In the left of the frame is the remains of Oxenholme MPD surplus to requirements as a provider of banking engines to Grayrigg. There are no known additional amendments and queries appertaining to the disposals of the LMS Class 8F 2‑8‑0’s Nos. 48000‑48399, but any information to the contrary will be welcomed along with any confirmations or otherwise of the verifications required.